Mozilla’s Firefox now features a full integration with the Pocket read-it-later service for saving text and video. In addition, Reader View now offers users a distraction-free reading mode that’s similar to Apple’s Reader mode in Safari and the functionality of the popular Readability extension and bookmarklets. Integrating third-party services like Pocket is a very unusual step for Mozilla and will likely come as a surprise to Firefox users, especially those who used to use Firefox’s Reading List feature, which has now been removed in favor of a proprietary service. 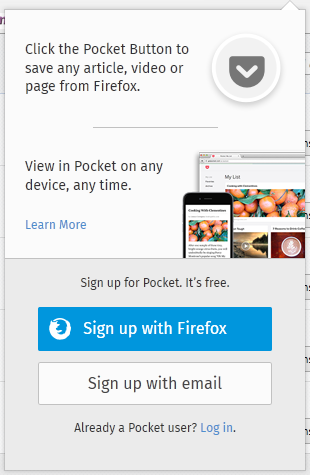 Pocket has integrated Mozilla’s Firefox Accounts for creating new accounts and signing in users and the Pocket button now prominently features in Firefox’s user interface. If you don’t want to use the service or you want to keep using its own add-on or bookmarklet instead, it’s easy enough to hide it (though because it’s not an add-on, completely disabling it is a bit harder). While Firefox users may have mixed feelings about this move, it’s obviously a win for Pocket, which will surely gain a few new users thanks to this integration. Pocket founder Nate Weiner argues that “Save” should be a platform, not a feature and that it takes a service that is truly available on any device to make this idea attractive to users. Mozilla probably could have built this kind of service from scratch, but must have decided that supporting applications on these different platforms from iOS to Kindle and Android to Windows wasn’t what it wanted to do. The new distraction-free reading mode does exactly what you think it does. It works like similar features in other browsers in that it extracts the actual article text from a website, displays that, and hides all of the ads, menus and other distractions on the site. There are not a lot of features here, but you can change the size of the font, switch between sans-serif and serif fonts for viewing the text, and choose between a light, dark and sepia background. The Reader View, too, features a prominent Pocket button. The only other major new feature in this update to Firefox 38 is support for screen sharing in Firefox Hello, the organization’s WebRTC-based video chat tool.